Welcome to the Croatia Football Shirts shop at Soccer Box. This is the place to shop for the official shirts, jerseys, shorts, socks and kit. 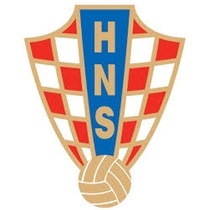 Prior to 1990 the Croatian national players played for the Yugoslavian national team. Since 1990 the Croatia shirt has become infamous in world tournaments, for fielding a strong squad that is not easy to beat. Croatia competes in both the UEFA European Championships and the FIFA Word Cup. They have yet to win any major trophies but for a newly established side they have a strong and solid record. Wearing the official shirts and merchandise is the perfect way to cheer on this unique national team during every competition international and friendly match. Order the Brand New Croatia National Team Football Shirts Online at Soccer Box! Nike is the manufacturer of the outfield shirts. The design of the official shirt was purposely created in 1991 following Croatia’s independence and launch of a standalone team. The stylish red and white chequered design was created by Miroslav Sutej and is now iconic of the home shirt. The Croatia home team shirt usually features a full red and white chequered design. The away jerseys is usually blue with red and white chequered trim. Whether you choose the home or away soccer jersey wearing the shirt is the perfect way of showing your national pride and support. FIFA rankings are a good way of identifying the top national teams, and those that are rapidly improving. Croatia is one of only 2 teams to be awarded the title of Best Mover of the Year twice. In 1994 when the shirts and jerseys were first officially recognized by FIFA their ranking was 125. Croatia 1st appeared in the World Cup tournament in 1998. In this very year they finished in 3rd place, a staggering feat that pushed the teams FIFA Ranking to 3rd. A huge move deservedly entitling them to the Best Mover of the Year award. Since this time Croatia has regularly secured qualification to both the UEFA European Championships and the FIFA World Cup. The team has always made a splash, but has not managed to better their 3rd place record. In the European Championship the furthest round that has seen the shirts and jerseys was the quarterfinal in 2008. The teams fans are loyal to their team; they turn out to matches sporting the latest jerseys as well as a selection of official accessories, available here to purchase at Soccer Box. As well as the Croatia home football shirt and away shirts browse the selection of accessories we also have available. Using football merchandise and accessories is another great way of identifying yourself as a fan and showing pride in the team. At Soccer Box we stock an extensive selection of shirts and kit for many national teams, as well as club teams from the Premier League and Italian Serie A. Use the menus to explore the extensive selection of kit and merchandise we have available for immediate dispatch and fast delivery. Order Your Croatia Soccer Jerseys and Football Shirts Online or Call the Order Hotline Today!